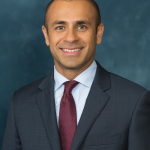 Dr. Shitanshu Uppal is an Assistant Professor at the University of Michigan in the Division of Gynecologic Oncology. He received his medical degree from the All India Institute of Medical Sciences in New Delhi, India. Following medical school, he completed his residency training in Obstetrics and Gynecology at Temple University Hospital in Philadelphia, Pennsylvania and, subsequently, his fellowship in Gynecologic Oncology at the University of Wisconsin in Madison, Wisconsin. I have a busy clinical practice focusing on taking care of patients with gynecologic malignancies. My clinical areas of expertise include laparoscopic, robotic and conventional surgery for cancer, in addition to chemotherapy clinical trials. I am also a health services researcher with a focus on optimizing surgical outcomes, as well as improving medical decision making for optimal utilization and judicious use of resources to provide patient-centric evidence-based cancer care. I have extensive experience in clinical research design and statistical methodology to study the quality of care outcomes. As a clinician researcher, my focus is to provide high quality care to my patients by determining possible areas of clinical process improvement and rigorously performing scientific studies to rectify problems. My previous work has largely centered around identifying ovarian cancer patients who do poorly after aggressive surgical efforts to determine an ideal sequence of chemotherapy and surgery to optimize outcomes. I have also focused extensively on the question of improving surgical outcomes of patients undergoing procedures in a teaching hospital with resident involvement. I have a keen interest in studying variation in palliative care utilization across multiple medical specialties as well as identification of barriers in utilization of advanced directives.